Illus. in full color. 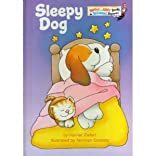 A dog and his pet cat share good-night kisses and playful dreams until morning wakes them, in this bedtime story for youngest beginning readers.